Damn, I guess he really did want his three trillion yen. I promised myself I’d go to bed early tonight and I failed. Where does the time go? It doesn’t help I have that delayed sleep cycle problem. Oh well. To be honest, I didn’t know about this until Conan told me about it. At work, I sit in a somewhat secluded area of the floor. I have no one to my right or left. There are two desk behind me but no one sits at them. I use these desks to store extra crap I don’t have space for. Last week, our production coordinator came over to my area and looked at the two desks behind me. She asked if the bag on one of the desks was mine. I said yes and she told me I’d have to move it because a new engineer was coming to work on our team. Boo! I mean, yay, new team members means less work for everyone. Anyways, I begrudgingly moved my bag back over to my area. IT came over the next day and set up the new guy’s computer and associated equipment. I found out that new guy was going to start this Monday. On Friday, just before the start of the weekend, I overheard my manager talking to another one of our engineers. It turns out the new guy had a change of heart and bailed on us. After accepting our offer, he changed his mind and took an offer from Blizzard. Is changing your mind after accepting an offer slightly bad form? For sure, but when you consider his other offer was from Blizzard, then it’s somewhat understandable. It’s almost guaranteed his pay will be higher and of course, in US dollars. If you’re into games, then Blizzard is a pretty cool company to work for. So tomorrow, no one will be at the desk behind me. This does not, however, eliminate the business need for more engineers on our team. We will still need to hire someone and that new person will eventually wind up sitting behind me. My air quality monitor arrived in the mail today. It takes PM2.5 readings, which detects particulate matter (PM) with a diameter of less than 2.5 micrometers. I placed the monitor in my bedroom, where I probably spend most of my time in my home, given I sleep there. For most of the early evening, the readings were great, in the low teens, with a low of eleven. If you’re not familiar with the scale, look here. It was right at the border between “good” and “moderate” on the air quality index. It got a little worse late into the evening, with the readings staying in the mid-20s, with a high of 29. I’m not sure why it got higher in the evening, it’s possible the smoke is returning. The good news is the air quality is my bedroom is pretty good, at least using a PM2.5 measurement. I wish this monitor had the functionality to measure PM10, which is for dust-sized particles but perhaps I’ll look into that later. In the video above, professional competitive eater Matt Stonie eats five buckets of fried chicken. I am envious. I love fried chicken. I believe the smoke that hangs over this province is starting to affect my health. I’ve been dealing with a cold since last week and I really wonder if my runny nose and cough would have been gone by now had the skies been smoke-free. I’ve been coughing since the weekend. I’m now running my air purifier in my bedroom on high as soon as I come back from work. Usually, I just have it on the lowest setting 24/7. I’m now leaving in on the middle setting while I sleep. I’ve also ordered another air purifier for my living room area. When will the smoke go away? I have a new appliance arriving in the mail on Wednesday. It’s an indoor air quality meter. I’ve always wondered how good the air is in my apartment. It gets very dusty in my place quite quickly. I have to dust about once a week or things get dirty. With the spate of wildfires in this province, the smoke that hangs over the city has added to my concerns about what I’m breathing when I’m home. I already employ an air purifier in my bedroom but this new device will allow me to see if it’s making a difference. I eagerly await the readings. I’ve been battling a cold for the last few days and strangely, it’s been causing me to wake up early. I’m not particularly congested nor am I coughing too much, but something is causing me wake up two to three hours before my alarm time. I can’t seem to fall back asleep either. To help solve this problem, I’m trying Neocitran for the first time. I have the drowsy, night time version. I drank some of it about an hour ago and so far, I’m not really feeling a whole lot. I thought it was supposed to knock you out but I could probably stay up for a few more hours as is. Well, I’m gonna crawl into bed anyways. As promised, here’s just some of the stuff I picked up this week at SIGGRAPH 2018 in Vancouver. I got a lot of pins, most from Google. Interestingly, there are two British Columbia related pins. One is the shield of this province, this was given out at the booth where you could inquire with the provincial government as to how to immigrate to this province. The other native Indian art pin was given away at the Campbell River booth. Yes, the small town of Campbell River was at SIGGRAPH promoting the town as viable place to live with enough Internet infrastructure to be able to work remotely. I also got a really cool notebook from Google and a lovely notepad from Disney. The notepad has some awesome light sketches of their most recent and loved characters. 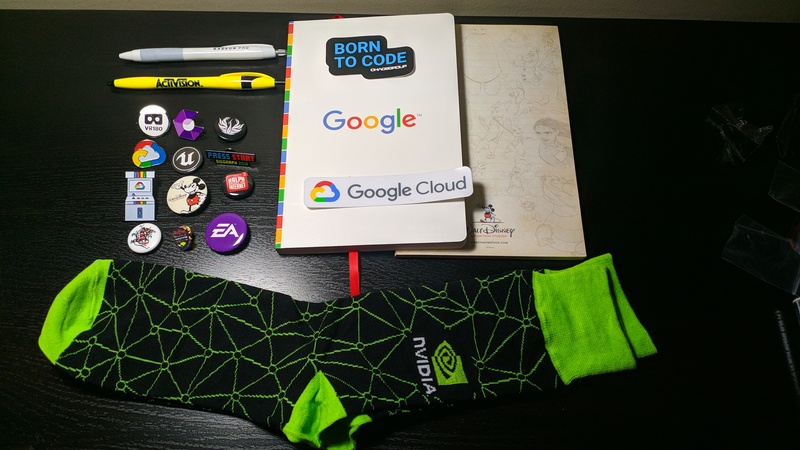 Last but not least, I got some socks from Nvidia! I’m more of an AMD guy but I’ll definitely wear these socks!